Gurudevshree Kanjiswami, a Saint from Gujarat, has propagated the most successful Jain movement in recent times. He was instrumental in the revolution of perception and practice of Jainism, thereby putting thousands of souls on the true path of Salvation. The philosophy and truth always existed but their true exponents were missing in actual practice. The focus had changed from self realization to rituals and mithyatva -false belief was reigning supreme. Gurudevshree Kanjiswami was born in Umrala, Gujarat, on 21st April 1890 (Vaishakh Sud 2, Vikram Samvat 1946) to mother Ujamba and father Motichandbhai. Kanji took basic education in Umrala but moved to Palej, near Vadodara, with his father since his mother passed away when he was only 11 years old. He joined his father’s grocery business at the age of 17. He was very sharp, honest, righteous and straightforward in business. 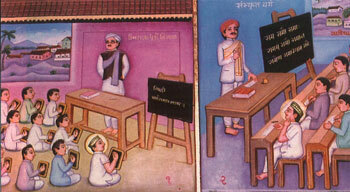 Business was expanding exponentially, but Kanji was more interested in following the path of Jain Saints. Even while running the shop, he somehow took out time to read scriptures and meet Saints. He told his elder brother Khushalbhai that he was not keen on marriage and took Swetambar Sthankvasi renunciation at the age of 24. From a very early age, Gurudevshree Kanjiswami lived a completely conscientious, deliberative, distinctive, intelligent, purposeful and devoted life. He lived a highly Saintly life with perfect celibacy. After deep meditation and study, he felt that the true path was something different from what was generally followed. Gurudevshree felt that the real path of salvation has gone astray from its genuine direction. The real shravak (Jain householder’s) path is complete absorption in experiencing and enjoying realization of the soul. Without this, the external penances in various forms are meaningless. Pujya Gurudevshree Kanjiswami’s conscience was searching for eternal truth right from his childhood and as destiny would have it, in the year 1912 AD (V.S. 1978) the ultimate scripture on spiritual science Acharya Kundkunddev’s ‘Samaysaar’ came in his holy hands. Like an accomplished jeweller, he identified this composition of spiritual wealth as the most precious jewel. With benignity of Samaysaar, he sighted his inner self. This also transformed his pious soul. The lost disposition found its own destiny and the stream of applied knowledge found its direction. As Gurudev made an in-depth study of ‘Samaysaar’, he experienced profound spiritual wisdom of Acharya Kundkund, which was inherited by the Acharya from the Omniscient Lord and then he saw that the essence of their preaching was retained very carefully. Gurudevshree fully believed in philosophy earmarked in Samaysara as genuine and true. He was experiencing distress about his own self and his own behavior as a Sthanakwasi Saint. He ultimately decided to make a big change and leave the Sthanakwasi sect on the birthday of Lord Mahavir in 1935 AD (V.S. 1991) at Songadh in Saurashtra region of Gujarat. Gurudevshree used to say that Jainism does not belong to any sect. It is the religion of the soul. It has no unanimity with any other sect or religion. Gurudev never had an intrinsic interest in worldly activities. His entire life was soul-oriented. He never ever failed in maintaining the daily routine of self studies, meditation and the deep introspection of the scriptures. He always desisted from things other than salutations to the Lord, giving sermons on scriptures, devotion to the omniscient God and discussion on Jain philosophy. He studied almost 200 scriptures and gave explanations in sermons thrice a day unabatedly for 45 years at the Golden town, Songadh. The teachings in Samaysara paved the way for self-realization (Samyak Darshan) and opened the right path for the devotees. He was able to bring out the basic principles of life as depicted in the Scriptures and gave the right method of practicing these texts. The soul is completely detached from worldly surroundings. The righteous Belief (darshan,) Knowledge (gnan) and Conduct (charitra) are the basis of true religion. Nobody can understand true religionunless he follows the threefold basis in its entirety. Personal effort (Purusharth) for achieving salvation is the necessity. Nothing else can help. He used to say that - - for those who are engaged in personal effort to secure Salvation, there are not many lives to live. The inborn nature of soul is pure and should behave in a pure form. However, since time immemorial, soul is misbehaving by having faulty notions. Gurudevshree Kanjiswami's life inspires us to always be active in the direction of Salvation. Gurudevshree's sole purpose was to find a remedy for the end of all future lives in the present life itself. This was the path and the objective he set for his followers. If Gurudevshree had not explained to us the true principles, we would have probably never understood the steadfast Soul (dhruva tatva). He was like a light to save us from a misleading path. Hence, we owe a deep debt of gratitude to our revered Gurudevshree for leading us by practice and percept to the path of Salvation. Today over 9,000 hours of audio recordings of Gurudevshree's lectures are available. (Explore www.vitragvani.com). Adhyatma Teerth Kshetra Songadh has become a centre of spiritual learning. The temple complex at Songadh is ever-expanding and quenches the thirst of spiritually inclined people the world over. Numerous Digambar Jain temples with study centres by Gurudevshree’s followers have come up in all the major cities in India and some abroad as well. On 28.11.1980 (V.S. 2037 Kartak Vad 7) Gurudevshree made a great departure to the heaven in a state of samadhi, as would accrue to a knower of the self, leaving his devotees bereaved and creating a void which will not be filled for a long time.